Prof Jayashri Kulkarni looking comfortable on the EVestG chair, now about to be funded further by a CRC-P.
Congratulations to Professor Jayashri Kulkarni for the $2.2 million grant the Monash Alfred Psychiatry research centre (MAPrc) was successful in obtaining for investment in its EVestG™ chair project, "Tech-enabled Care Pathways for Head Trauma". The grant is a Cooperative Research Centre Project (CRC-P), with dollar-for-dollar funding being provided by MAPrc's commercial partners General Electrics (GE) and the company "Neural Diagnostics" who lease the intellectual property (IP) for the device. 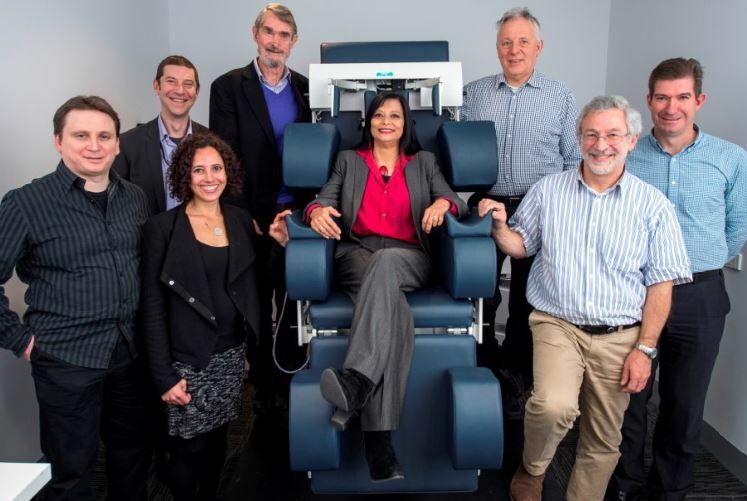 The funding will further develop the EVestG™ chair project, which is MAPrc's diagnostic tool using the vestibular system as a "window" to the limbic system, in effect an "ECG for the Mind". The MAPrc team won the ABC show "New Inventors" award for best invention in 2010 with the early prototype of this device, and was a Eureka Award Finalist in 2015. The team will be conducting clinical trials in depression and traumatic brain injury to validate the diagnostic capacity of EVestG, as well as using some of the funding to further develop the device. Why is the EVestG chair important and how does it work? Concussion, head trauma and their complications (such as major depression) related to sports and other accidents costs Australia more than $2Bn p.a. Faster, objective detection and monitoring of severity of symptoms and injuries is critical for better outcomes. This CRC-P will develop affordable and efficient care pathways extending from the playing field (or point of injury) to recovery by validating EVestG and other magnetic-based neurotechnologies' ability to quantify changes in the brain after injury. Detecting concussive injuries and monitoring functional recovery or any emergence of Major Depression (MD) is slow, subjective and inaccurate with an annual global cost >$200Bn, and in Australia, approx $2Bn. This CRC-P will combine 3 neurotechnologies: Electrovestibulography (EVestG™), Trans-cranial Magnetic Stimulation (TMS), and Magnetic-Resonance Imaging (3T-MRI), to create a faster and more cost-effective care pathway for people with concussion – from injury to recovery and return to play/work. Published evidence indicates that the EVestG chair can objectively detect and diagnose people with changed brain function. EVestG is unique in its ability to measure deep-brain function from the balance system with an information-rich bandwidth 100 times more sensitive than electroencephalography. As such, it has a role in a pathway of care for concussion, as Loss-of-Balance and cognitive inattention are the first observed symptoms and the last to resolve. This CRC-P will validate brain changes following concussion as detected by EVestG, TMS and 3T-MRI, and develop care pathways using combinations of the 3 devices: e.g. rapid, objective screening of concussion on the field of combat, work or sport could occur using a portable and affordable TMS device, with the injured then referred to clinics for further objective evaluation and monitoring of recovery with EVestG and/or 3T-MRI.